Caption this Easter Bunny scene. "The hat has spoken - GRYFFINDOR!" Reason: Not being familiar with Harry Potter, I didn't get this one at first. But once I did, I decided to pick it. Because I can. Sick and tired of laying eggs, cranking out chocolate likenesses of himself, hiding baskets-- seriously the whole Easter shebang, the Easter Bunny inappropriately crowns Easter Parade Marshall Freida Wilcox with a fully-loaded bird's nest. On your shoulders, a lovely dead animal! No, honey, you're not at all gullible!" 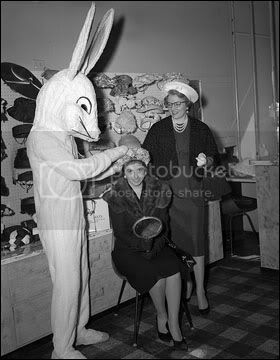 It was all fun and games until the rabbit began to trim Miss Wilson's hair with his teeth.